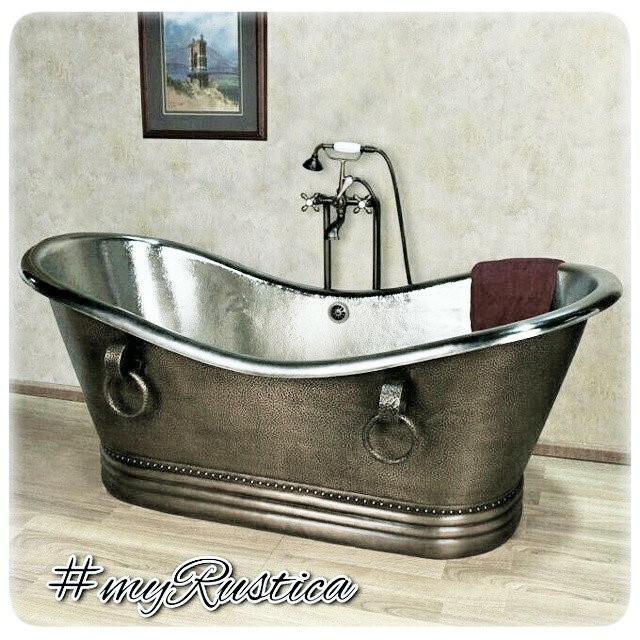 Click the button below to add the Copper Bathtub '9915' to your wish list. Rustic legs add elegance to this copper bathtub. This free standing bathtub is made of hammered copper and its legs from sand cast bronze. You can choose the patina finishing from the product options below the price as well as the tub length. It will take about four weeks to deliver sku D4C9915 to the US mainland addresses. The copper bathtub with bronze legs is available in various sizes and drain-back system as an option. Caring for hammered copper and bronze is simple. For cleaning use soapy and water. Use plastic nylon brash and dry it with soft toweles. Don't scab with metal objects as they may damage the bathtub. Using alcohol and citrus substances on copper is not recommended. They might discolore it. Contracting a plumber for a copper bathtub with bronze legs installation is recommended.